How does propane compare to other fuels? How can I make sure that the gas provided by a company is safe for my home? At Northwest Propane, our top concern is your safety. Nearly five million households in the United States rely on propane for heating, and over three million use propane for home water heating. It has a narrow range of flammability and cannot be ingested like alcohol fuels or gasoline since pressurized containers release vapors. 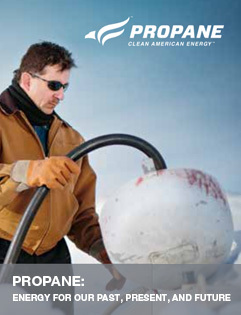 Propane performs equal to natural gas, making propane a safe fuel to heat your home. It is quite safe as long as you follow proper safety precautions. To assure that your propane system operates safely and efficiently, we provide quality installation and inspection services. Our licensed professionals inspect and repair new or existing units before filling pumps at your house. Also, preventative maintenance programs are available to ensure proper upkeep of your appliances guaranteeing that your family enjoys a healthy and safe environment. Why should I use propane gas? Propane is a reliable and trusted energy source used by millions of Americans each day. It fulfills energy needs by burning efficiently and cleanly, giving you more value for your energy dollar. In addition, the vapor is eliminated from the environment faster than it takes for it to become introduced into the atmosphere and impact the global climate, making its carbon footprint lower than most other fuels. Contact our specialists to hear more about why you should use our residential propane services. Common uses for propane in your home include furnaces, outdoor grills, water heaters, air conditioners, and kitchen appliances. Switching to propane provides tremendous financial savings. Also, after you make the switch, you will find propane is a more widely recognized cleaner-burning, low carbon fuel. In addition, residential propane incentives and rebates are excellent reasons to be a Northwest Propane customer.